The MySpace phenomenon has spawned a large ecosystem of derivative sites that exist only to serve it. mypictr is one of these sites (although it's not exclusively MySpace-oriented). You can use it to create a profile picture for your social network of choice. 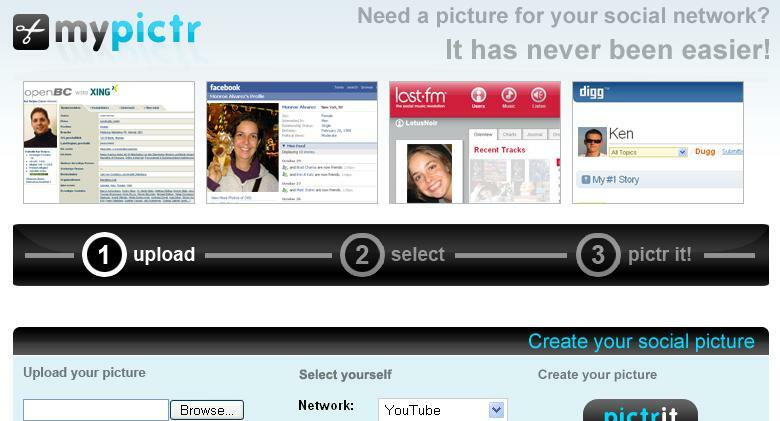 All you have to do is upload a picture and select what social network you want a profile picture for. The cool thing is mypictr automatically chooses the right dimensions for your picture for each network. YouTube, MySpace, deviantART, last.fm, Flickr, and many other networks are supported. Judging by the poll to the right, many of you won't find it useful, but I thought I'd point it out.